The third album of the Bosnian Premier League was released in March 2017 by the same publisher Sky Media. Also for this edition there is an hardcover version of the album (which is however not yet at the level of the hardcover albums Panini). The collection includes all the 12 clubs of Premier League with team photos, club badges and stadiums. The number of teams of the league was reduced this season and therefore also the total number of stickers dropped from 359 to 295. 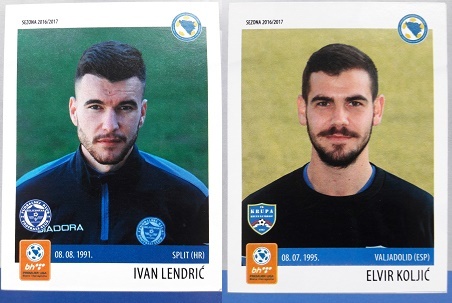 The albums starts with two introductory pages and seven shining stickers: the league logo (a puzzle of four stickers), the trophy, the Bosnian federation logo, and the sponsor. Then there is a fantastic overview of all the club stadiums. Each stadium is composed by two stickers for a total of 24 stickers in this section. Clubs are displaced over two pages with a total of 22 stickers: the club badge (shining sticker), the team photo (two stickers), the coach, two goalkeepers (orange border), and 16 players. The Premijer Liga 2016/2017 was played with a regular season and a championship round, after which Zrinjski Mostar won the title with only one point more than Zeljeznicar Sarajevo. Top goalscorer was Ivan Lendric (Zeljeznicar) with 19 goals.